Thank you all for helping to make SIS’s 2017 fundraising efforts a success. In 2018, we are hoping to take fundraising to the next level at the SIS 26th Annual Meeting in Chicago, August 15-18, 2018. We are planning a much larger silent auction, as well as an exciting charity event. SIS is a tax-exempt organization under section 501(c)3 of the IRS code and your contributions are tax deductible to the extent allowed by law. 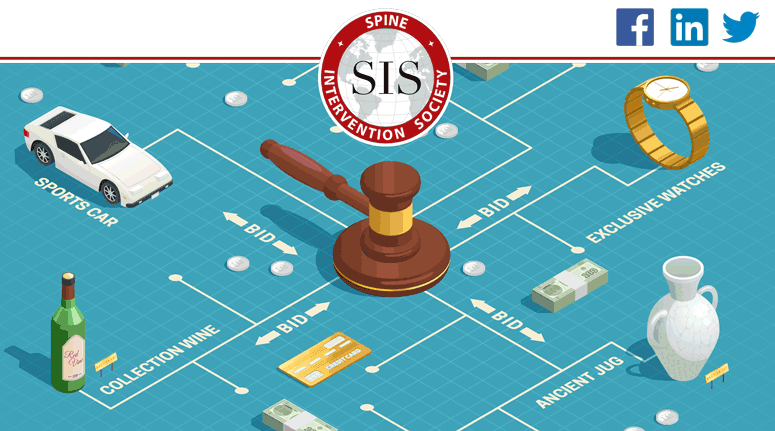 Every dollar we raise for SIS helps us achieve our mission to develop and promote high quality interventional spine care and pursue our vision of safe and effective spine care for all patients. But we need your help! We are seeking items of value that would be easy to contribute. For example: event tickets that you cannot use, a stay in a timeshare during a time when it may otherwise be empty, collectors’ items, access to experiences of value, or anything else that might be of interest to others. All donors will be recognized for their contributions. If you have a donation, ideas, or questions please contact me at zmccormi@gmail.com or Margaret Klys at mklys@SpineIntervention.org.